Glutamine is highly in demand throughout the body. It is used in the gut and immune system extensively to maintain optimal performance. 60% of free-form amino acids floating in skeletal muscles is L-glutamine. L-glutamine plays a very important role in protein metabolism, and it appears to be a very important nutrient for body builders. When supplemented, it may help body builders reduce the amount of muscle deterioration that occurs because other tissues that need glutamine will not rob the glutamine stored in the muscle cells. Glutamine is one of the twenty nonessential amino acids. Nonessential means the body can produce this substance itself. Sixty percent of our glutamine is found in the skeletal muscle, with the remainder residing in the lung, liver, brain and stomach tissue. More than sixty percent of our free amino acids come in the form of glutamine and under normal conditions our body is able to produce more than enough to handle the load. But, during times of stress, glutamine reserves are depleted and need to be replenished through supplementation. Research is showing that glutamine depletion caused by stress can be activated by something as minor as a common cold and the level of depletion increases with the severity of the disease. The important thing, as fitness enthusiasts, is to remember that stress related glutamine depletion does not only occur with illness, but also occurs due to stress caused by exercise. Intensive exercise will disrupt immune function; increase lactic acid and ammonium levels. High levels of ammonia can affect muscle function. Within the first five minutes of exercise glutamine levels will rise and catabolic hormones are released. Even at the conclusion of the exercise session the muscles will continue to release glutamine causing a severe depletion situation. And the harder you train the higher the rates of depletion. Why does glutamine depletion happen so quickly? Because glutamine increases the hydration state of the muscle cells. Hydration of the muscle cells can change rapidly, and once the cells are dehydrated they enter a catabolic state. During times of catabolic stress research has shown that glutamine levels can drop by as much as 50%. Overtraining will result in less gains, but also higher disease rates, infections and a poor immune system, due to the heavy demands place on the energy reserves of the body. Higher levels of training result in higher stress demands on the body, which lead to a reduction in plasma glutamine levels. Weightlifters and bodybuilders need to realize that glutamine is critical for muscle building because it is a nitrogen donor, meaning that it moves the nitrogen around in the body to where it is needed. Anyone that pushes the iron understands that a positive nitrogen balance is necessary criteria in the effort to gain muscle mass. Entering the Krebs cycle as a non-carbohydrate source of energy, glutamine converts to glutamate and produces ATP, which is an energy molecule. With adequate amounts of glutamine in the body through diet and/or supplementation, little or no muscle is broken down to provide glucose. And, remember, too little glutamine results in muscle atrophy. Glutapure is the ultimate anti-catabolic preventing muscle wasting which lessens the degree of muscle damage and soreness. Glutapure helps the body to secrete its own growth hormone which trigger's the release of IGF-1 (Insulin Growth Factor 1). This hormone helps promote weight loss, increase lean body mass, and increase bone density. Glutapure neutralizes lactic acid burn in your muscles by releasing Plasma Bicarbonate allowing you to work out longer and stronger. 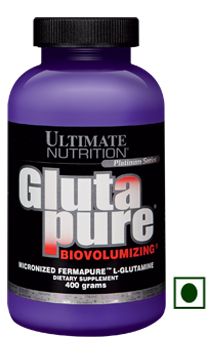 Glutapure also increases your Nitrogen balance to help you stay in a positive balance for optimal muscle growth. Glutamine enhances the health of your immune system and play's a critical role in the health of the brain, lungs and liver. Each bottle contains 100% premium pure glutamine, produced using patented state-of- the-art FermapureTM technology. This innovative fermentation process produces the highest quality, micronized L-Glutamine available in the world today. Only Glutapure exceeds FCC, USP and Pharmaceutical Quality Standards.